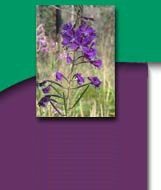 Welcome to the FOREST FIRE IN THE NORTHERN ROCKIES web site. Our goal is to provide a clearinghouse of scientific information regarding the historic role and present place of fire in western Montana and northern Idaho. Why? Because the forests in our neck of the woods are unique. Although they are superficially similar to those of the Southwest and other western lands, the ecological nuts and bolts of these habitats differ considerably. Historic patterns of fire occurrence and present challenges in fire management differ as well. These pages house comprehensive reviews of topics - from fire history, to the ecological effects of fire, to the rationale behind forest restoration and rehabilitation - all based on information specific to forests of this region. We have tried to condense pertinent yet often complicated findings from local studies into a series of summaries accessible to folks at all levels of education and from all walks of life. To what extent were our forests visited by creeping ground fires versus sweeping crown fires? Are forests destroyed by wildfires? What would happen, ecologically speaking, if our forests never burned again? Can we replace wildfires with controlled burns and forest thinning? 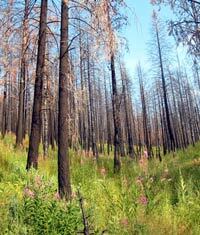 Do forests need to be rehabilitated after severe wildfires? How do our activities help forests recover? We hope that the following information will help answer these sorts of questions and enable residents of western Montana and northern Idaho to make ecologically sound fire management decisions. The ensuing lowdown is a synthesis of scientific reports, most of which have been published in government documents and peer-reviewed journals. Whenever possible, we have augmented and clarified the published information by interviewing local scientists. As a result, we are able to relay the tale of fire in the Northern Rockies based on the most up-to-date information collected by local experts right in our own backyards. It is a fascinating story. Read on. This web site is brought to you by the Avian Science Center and the Montana Natural History Center, with funding through the Science Minigrant Program of Environmental Defense and the Bullitt Foundation. Recommended citation: Cilimburg, A. C., and K. C. Short. 2005. Forest fire in the U. S. Northern Rockies: a primer. Retrieved month day, year from http://www.northernrockiesfire.org. Last update -- August 1, 2005.